4 Bedroom Detached House For Sale in Liverpool for Asking Price £485,000. This four bedroom, detached property has been finished to a high specification and must be seen to be appreciate. This impressive property boasts a rear open plan kitchen/dining space with overlooking mezzanine, reception room, two ground floor bedrooms with en-suites and master dressing room, bathroom and two further bedrooms, one with en-suite, to the first floor. 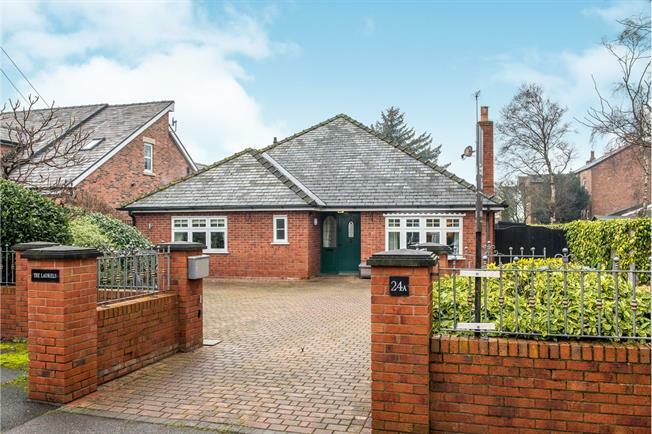 The property also benefits from a beautiful, Westerly facing rear garden and generous driveway to front via gated access. Internal inspection is essential to fully appreciate. Spacious entrance hallway via glazed, wooden entrance door with side window. Travetine floor tiling with under floor heating. Living flame gas fire with marble surround. Oak flooring with under floor heating. Double glazed window to front. Kitchen comprising Fitted wall, base and drawer units with complementary stone worktops with inset stainless steel sink. Neff appliances including; double oven, induction hob, microwave and dishwasher. Integrated Fridge and Freezer. Travetine floor tiling with under floor heating. Double glazed French doors to garden. Velux skylights with remote controlled blinds. Mezzanine level overlooking. Vanity unit with inset basin and mixer tap. Low level wc. Plumbed for washing machine. Under floor heating. Sink and drainer with mixer tap. Travetine floor tiling with under floor heating. Double glazed French doors. Rails, shelves and drawers. Velux double glazed window with remote blind. Feature "Jack and Jill" wash basins inset drawer vanity unit. Tiled bath with mixer tap. Heated towel rail. Low level wc. Bidet. Double glazed window. Double shower cubicle with thermostatic power shower. Wash basin. Low level wc. Heated towel rail. Shower enclosure with thermostatic shower. Storage with inset basin. Low level wc. Extractor. Heated towel rail. Tiling. Velux, double glazed window. Radiator. Access to storage/"den" with deceptively spacious eaves storage. To front Private entrance gates leading to generous private parking space. To rear Westerly facing garden, mostly laid to lawn with Indian Stone patio, impressive water feature and Weeping Silver Birch.